Mobily, a leading Saudi Arabian telecommunications services company, and Huawei, a leading global provider of information and communications technology (ICT) infrastructure and smart devices, have signed a Memorandum of Understanding (MoU) to expand their collaboration in network evolution. The companies announced a five-year plan to upgrade Mobily's networks and accelerate the arrival of 5G to the Kingdom. The announcement was made at Huawei's global headquarters in Shenzhen, China, during a recent visit by Maziad Al-Harbi, Chief Technology Officer at Mobily. Mobily and Huawei's five-year plan, named Network 2023, will see an End-to-End (E2E) network evaluation and evolution strategy to upgrade Mobily's existing infrastructure and help Saudi Arabia capitalize from 5G from both an industry and consumer perspective. 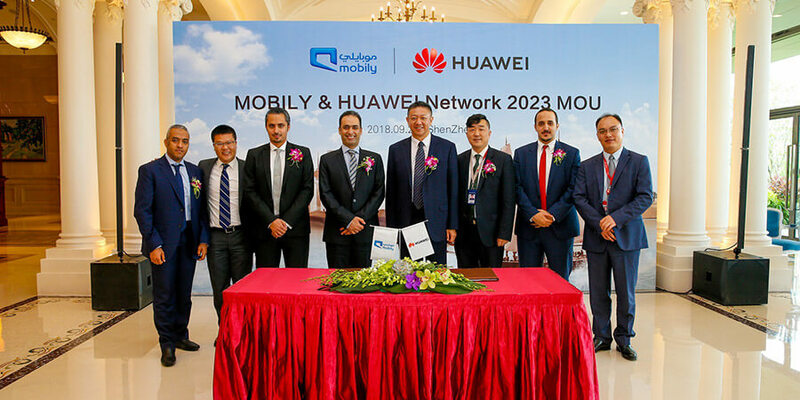 As a network evolution strategy consultant, Huawei will assist Mobily with its 4.5G to 5G evolution, and its target network planning (including spectrum and user experience). The companies will collaborate to fully cloudify Mobily's network to make it ready for 5G, in addition to cooperating on IT and data center strategy and planning. Huawei will also act as Mobily's consultant from an industry and consumer perspective, offering market and business insights and strategy. Ultimately, the aim of the MoU is to strengthen the relationship between Huawei and Mobily in order to bring the most updated and advanced E2E networks to Saudi Arabia. By combining Huawei's E2E portfolio of advanced ICT products and solutions with Mobily's excellence in customer service, the companies hope to create new digital services and revenue streams, enhance operational efficiency, reduce costs, decrease time-to-market, and increase Mobily's customer base. Maziad Al-Harbi, Chief Technology Officer at Mobily, commented, "We are excited to combine forces with Huawei to ensure that Saudi Arabia remains at the forefront of the latest trends and technologies in 5G. Innovation is vital to enabling the Kingdom to transform into a digital country, and at Mobily we are committed to deploying the most advanced technologies to provide the people of Saudi Arabia with a high standard of living and a modern environment. Our collaboration with Huawei will surely help us reach this goal." Dennis Zhang, CEO of Huawei Tech Investment Saudi Arabia, added, "We are proud that Mobily has selected Huawei as a partner to lead their development in the field of 5G. At Huawei, we aim to play a leading role in assisting the government in reaching the goals outlined in Saudi Vision 2030 to become a diversified, knowledge-based economy, and intelligent and agile telecommunications infrastructure is vital to the success of these aims. 5G in particular promises to accelerate the Kingdom's digital transformation by creating new industries and revitalizing old ones, and we look forward to collaborating with Mobily to bring these benefits to Saudi Arabia."